5. Potential Group Purchases of Equipment, Pot Luck Supper, Gossip & General Conflab. Welding Gloves with their long cuffs and soft goat skin make a sturdy bee gloves at the right price. Three or four sizes At the Welding House, for $5.00(Thanks to Jim Heald for the tip. )Another alternative - If still cautious about bare-hands in the hive consider using quality, rubber dish gloves. Cheap. While a determined bee can surprise & sting through these thin rubber gloves, you have both a degree of protection and a good tactile sense while handling the frames. Long-time area beekeeper, Betty Paradis, has used this style of glove for years. Meetings are on the first Tuesday of every other month. No meeting in January. July meeting is dedicated to a workshop. We have lost our VP, Herb Bax, who is moving to southern Ontario. If you are willing to take this position on, please let one of the executive know. Elections will be held this November, but we can always use interim help! Beekeepers who have raised nucs (as we requested) to help fill the demand, if you haven't already - Please contact Valerie & Rob, our local Bee Inspectors, both for inspection and to let them know that you have nucs to sell. The following Beekeepers(alphabetical order), offering to sell nucs and queens have Selling Permits - this means during 2008 our two local Bee Inspectors have visited their apiary checking for varroa & trachea mites. Clean! Thanks for making a great effort to supply bees for everyone this summer. It was a challenge, as there were many requests. Looks like you were successful! Barry Tabor has contacted Don Jackson. Don said the best time for a workshop is in September, as he is busy extracting in August. Don would like a rough idea of the numbers that would be attending. I told Barry we could ask in the newsletter, and get back to him. Maritime beekeepers lost more bees than expected last winter. But the drop in numbers doesn't seem to be compromising blueberry pollination in the region. According to Joanne Moran, bee health adviser with the Nova Scotia Department of Agriculture, 26 per cent of Nova Scotia's honeybees didn't survive the winter. She says the number for P.E.I. and New Brunswick is about 40 per cent. 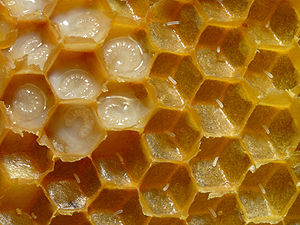 That's more than double the 15 per cent loss Canadian hives have typically suffered. Speaking during the peak pollination period last week, Moran says the lower number of bees has not meant a dramatic drop in pollinators. "In Nova Scotia, blueberry growers typically use 16,500 to 17,000 hives for pollination. My guess is that it would be about 16,000 this year," she says. "Successful pollination depends on the weather available. If you have beautiful pollinating days you can get away with fewer bees. They can pollinate acres and acres in a very short period of time if they have good flying weather -- and the weather hasn't been too bad." New Brunswick saw dramatically higher winter losses. But the number of honeybees in the province is about the same as this time last year, according to Michel Melanson, a blueberry and apiculture crop development specialist with the provincial agriculture department. That's because "New Brunswick beekeepers did quite bit of expansion over last summer -- but they lost the equivalent of their expansion." So overall, numbers have not dropped significantly. ABF - The worst bee disease !! There is a characteristic odour - hey, it's called foulbrood. This photo has a mix of healthy & sick brood. 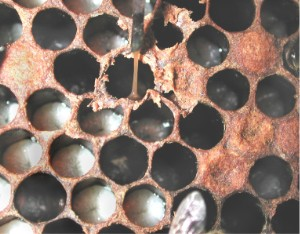 Capped cells with dead brood have sunken tops as seen on the bottom right. A good "field test" - use a small twig or tooth pick break the capping to puncture the dead brood, a sticky, 'ropy' thread will be usually be able to be drawn out. Caused by a bacterium - Paenibacillus larvae - AFB is the most destructive brood disease. Larvae up to 3 days old eat the spores along with their food. As the bacteria multiply in the gut the larvae turns from pearly white to dark brown. The infected larvae will eventually form a dry scale. They usually die after the cell has been capped. Each dead larvae or pupae has ~ ten million spores - that can survive for 20 plus years. When the 'housecleaning' bees clean out the scale or remove the dying larvae they contaminate their mouth parts - which, thanks to bee's normal mutual feeding in the hive, transfer the spores to all bees in the hive. 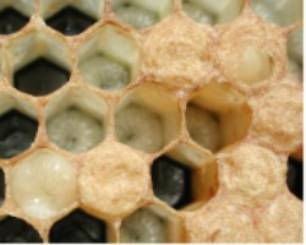 Strong, healthy colonies rob out weaken, diseased hives. Now every beekeeper in foraging range (8 km & can be twice that distance) is at risk!! Our two Bee Inspectors have found apiaries with AFB. There has been evidence of AFB on equipment this spring but no active hives with it as yet. 1. Do not give away nor trash any of the hives - that gets it out of your back yard but just spreads the disease. 3. Requeen all remaining colonies with new queens from Hygienic stocks. order a copy of Honeybee Deseases and pests. Still a few bright yellow t-shirts with TBBA logo on the front & 'worker bee' on the back. Reasonably priced at-cost $15. A queen and worker Argentine ants have many, many relatives. Introduced around the world, they form large colonies, becoming a significant pest. In Europe, one vast colony of Argentine ants is thought to stretch for 6,000km (3,700 miles) along the Mediterranean coast, while another in the US, known as the 'Californian large', extends over 900km (560 miles) along the coast of California. A third huge colony exists on the west coast of Japan. While ants are usually highly territorial, those living within each super-colony are tolerant of one another, even if they live tens or hundreds of kilometres apart. Each super-colony, however, was thought to be quite distinct. But it now appears that billions of Argentine ants around the world all actually belong to one single global mega-colony.